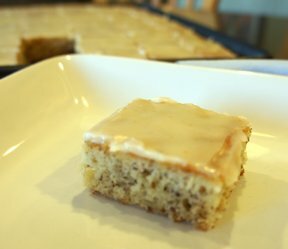 Simple to make but so moist and delicious. These bars are sure to become one of your family's favorite. This recipe makes a nice large batch, but they won't last long! Preheat oven to 325 degrees F. Grease a 10x15x1 cookie sheet. Combine the sugar, oil, and eggs together in a large mixing bowl. Beat until well blended. Add the flour, soda, cinnamon, and salt; beat until well mixed. Beat in carrot baby food until evenly mixed. Pour into the greased cookie sheet and bake for 25 to 30 minutes. Remove from the oven and allow to cool completely before frosting with the cream cheese frosting. Blend the cream cheese and butter together until smooth. Add the powdered sugar and vanilla; beat until smooth and creamy. If frosting is too thin, add more powdered sugar a tablespoon at a time until it reaches the desired consistency. 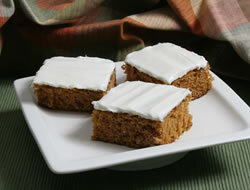 Spread evenly over the carrot bars. Refrigerate to store. "I loved these bars and so did my family. 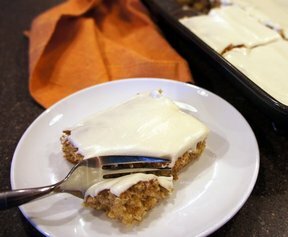 They are so moist and the cream cheese frosting is so good with the bars. It makes a big batch so it is nice when making for a larger group. The only problem I had was finding the junior carrot baby food. Had to go to two stores to find it."